Ubud, Bali (Indonesia) – June 16, 2017 (travelindex) – Best Western Hotels & Resorts has opened a charming new upscale resort in Ubud, Bali’s cultural heart and an increasingly popular tourist destination. Nestled within a lush forest, yet close to the main attractions of Ubud, Best Western Premier Agung Resort Ubud is the perfect place to unwind and discover Bali’s true soul. The classical charm and beauty of the “Island of the Gods” is captured exquisitely by the resort’s interior and exterior design, which is open-plan and features many traditional touches, such as wooden floors and Balinese furnishings. These are complemented by an array of modern amenities and facilities, including complimentary Wi-Fi, ensuring that guests at Best Western Premier Agung Resort Ubud have the best of both worlds. This intimate, low-rise resort features just 75 spacious rooms, all with comfortable beds, working space, state-of-the-art technology and a private balcony or terrace. Guests can cool off in the outdoor swimming pool, soak up the tropical sun on the large pool terrace, work out in the well-equipped fitness center, or enjoy soothing treatments at the on-site spa, which harnesses organic herbs and ingredients produced by an onsite farm. There is also a light, spacious restaurant that serves exquisite local and international cuisines in a semi-al fresco setting, plus a casual coffee shop, which is the perfect place to unwind and connect with friends and family. “This excellent new resort will also complement our three popular hotels in the Kuta area of Bali, giving guests the opportunity to experience the island’s beaches and culture in the same trip. I am confident that this outstanding new property will become extremely popular with our guests, and will be an excellent new addition to Best Western’s fast-expanding Indonesian portfolio,” Olivier added. Nestled in the island’s central uplands, Ubud is home to a wealth of activities and experiences. Guests at Best Western Premier Agung Resort Ubud are able to visit local attractions such as the Ubud Monkey Forest, the ancient Goa Gajah, or “Elephant Cave”, and the beautiful Tegallalang Rice Terraces. Alternatively, guests can simply browse the town’s many markets, craft shops and galleries. The resort is situated approximately one hour and 15 minutes from Bali’s Ngurah Rai International Airport in Denpasar, and a similar distance from the beaches and nightlife of Kuta. 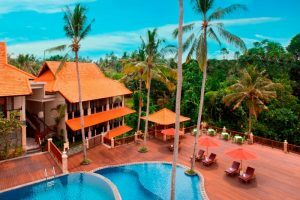 Best Western Premier Agung Resort Ubud becomes the company’s fourth hotel in Bali, following Best Western Kuta Villa, Best Western Kuta Beach and Best Western Resort Kuta, and joins a growing collection of 15 Best Western hotels and resorts across Indonesia. Best Western Hotels & Resorts headquartered in Phoenix, Arizona, is a privately held hotel brand with a global network of 4,200* hotels in more than 100* countries and territories worldwide. Best Western offers seven hotel brands to suit the needs of developers and guests in every market: Best Western®, Best Western Plus®, Best Western Premier®, Executive Residency by Best Western®, Vīb®, BW Premier Collection® and GLō®. Now celebrating more than 70 years of hospitality, Best Western provides its hoteliers with global operational, sales and marketing support, and award-winning online and mobile booking capabilities. Best Western continues to set industry records regarding awards and accolades, including nearly sixty percent of the brand’s North American hotels earning a TripAdvisor® Certificate of Excellence award in 2016, Business Travel News® ranking Best Western Plus and Best Western in the top three upper-mid-price and mid-price hotel brands for three years in a row, and Best Western receiving five consecutive Dynatrace® Best of the Web gold awards for best hotel website. Best Western has also won eight AAA®/CAA® Lodging Partner of the Year awards, recognizing the brand’s commitment to providing exceptional service and great value to AAA’s 56 million members in the U.S. and Canada. Nearly 30 million travelers are members of the brand’s award-winning loyalty program Best Western Rewards®, one of the few programs in which members earn points that never expire and can be redeemed at any Best Western hotel worldwide. Best Western’s partnerships with AAA/CAA and Harley-Davidson® provide travelers with exciting ways to interact with the brand. Through its partnership with Google® Street View, Best Western is the first major company of its size and scale to launch a virtual reality experience for customers, setting a new industry standard and reinventing how guests view hotels.